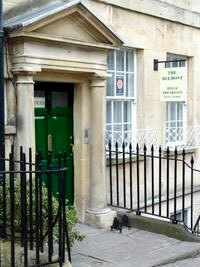 This simple and unpretentious bed and breakfast ranks as one of the cheapest options in Bath. Just across the road from Bath Assembly Rooms and dating back to the 17th Century. The Assembly Rooms is one of Bath's finest Georgian buildings and is a wonderful tribute to this splendid World Heritage site. The good news for guests at the Belmont is that it is virtually next door. This is terrific news indeed if you are arriving for one of the many business or wedding events taking place at the venue. This handsome Georgian Townhouse dates back to the 1750s and offers a credible combination of double and twin bedrooms, spread over three floors. Each of the guest rooms features a generous helping of period furnishings, and floor to celing windows. There is a large sitting room located on the first floor and some excellent views over Bath. The ground floor plays host to the Belmont dining room, and a continental breakfast is included in the price. Full English breakfast can be cooked to order.